I had to put up something amusing after that last post! And oddly enough, it's kinda related. 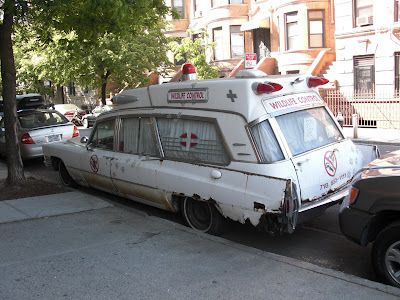 I saw this old ambulance on the street the other day. Any Brooklyn people out there know what this is all about? Yeay, first post. That's realy cool! And odd. AAAAAAAAAAAAAAAHHHHHHHHHHHHHHHHHHHHHHHHHHHHHHHHHHHHHHHHHHHHHHHHHHHHHHHH!!!!!!!!!!!!!!!!!!!!!!!!!!!!!!!!!!!!!!!!!!!!! i just finished catching fire and it has got to be one the best books i've read in my life. it's the sequel to hunger games and it is amazing the third book needs to come out now!!!!!!!!!!!!!!!!!!!!!! ahhhhhhhhhhhhhhhhhhhhh i hate waiting for books to come out!!!!!!!!!!!!!!!!!!!!!!!!!!!!!!!!!!!!!!!!! Why, Ghost Busters, of course! :D That ambulance is awesome. Gymnast20: I LOVE old things too. Its fun to go antiquing and find old treasures. Once I found a poster of the first 36 people executed in Ohio. The electric chair was named "Old Sparky". The man who made it ended up commiting a murder and being put to death in his own creation. Isn't that a perfect story? It cost $200 though and I can't afford that. I personally think it does look like an old Hearse. In which case if it was the I would never want to get in an ambulence like that because who would want to ride in a car that carrys the dead away? UGH I HATE WAITING FOR BOOKS TO COME OUT!! I hate waiting 4 books too!!!!!!!! I'm writing a story about the Salem witch trials for English class but I'm having trouble coming up with a title. Anybody have any ideas? Maybe it's a monster ambulance on it's way back to New York after trying to save the Blue Hill Horror. cool! very classy i think, maybe for a cool strange cars convention? Wow! A bunch of new posts! does this mean the book is coming out soon? who thinks they have swine flu? I do! why is evry1 freaking out about swine flu???? and is swine flu worse than normal flu? i love leven thumps Too!! Sisters grimm is SOOOOO awesome!!! Interesting photo. It does say Wildlife Control, so it's probably some kind of animal catcher's car. Idk. haha! someone in my town drives an old ambulance. charstar- you should read The Hunger Games- it's awesome! ALL YOU HUNGER GAMES FANS SHOULD READ REEEEEL LITERATURE LIKE I CAPTURE THE CASLE, + MIDNIGHT IN THE GARDEN OF GOOD AND EVIL+ EVEN LONESOME DOVE. its an epic. and i already had swine flu and its not that bad,really. This is the vehicle of choice of my seventh-grade math teacher, who a hair away from clinically insane, but who also feels very secure thanks to tenyer. He has another car which he drives to school- the pest control mobile is just for show, and rarely does more than move across the street.